A fresh and insightful look at a masterful politician, by the bestselling author of Churchill and Gladstone. Franklin Delano Roosevelt was a statesman whose massive achievements tower over the twentieth century. In a ranking of American presidents, he is rivaled only by George Washington and Abraham Lincoln. He was elected to an unprecedented four terms in office, and his accomplishments in leading the nation through depression and world war resonate to this day. Roosevelt's presidency was one of the most eventful in U.S. history. He took office in the midst of economic crisis: the stock market had crashed, the banking system had collapsed, and millions of Americans were unemployed. Galvanizing the nation with his 1933 inaugural address and with a flurry of legislation in the First Hundred Days, Roosevelt demonstrated an optimism and resolve that garnered quick support for his administration and for the programs that he called the New Deal. And he was the first president truly to understand the power of the new mass media, rallying the nation through "fireside chats" on the radio and speeches that were the mainstay of movie house newsreels. In acute, stylish prose, Roy Jenkins -- who was a prominent British politician as well as a bestselling historian -- tackles all of the complexities and intricacies of Roosevelt's character. Though not an intellectual himself, Roosevelt was nonetheless able to inspire the intellectual classes. He was from the higher reaches of the American upper class, and yet his great talent was to inspire confidence among working people during a time of economic and international turmoil. And when he had to shift his priorities after Pearl Harbor from (in his words) "Dr. New Deal" to "Dr. Win-the-War," he did so without any loss in the people's confidence. Franklin Delano Roosevelt was the dominant president of the twentieth century and helped the United States become the most influential world power. Roy Jenkins's keen assessment enables us to understand how he accomplished this and why he still stands tall in our estimation today. 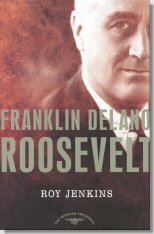 Franklin Delano Roosevelt is available at all fine bookstores.